Review progress on priority action areas. Develop mechanisms for enhanced participation of women and youth. Analyze and agree on emerging priority action areas. Ed Rege (PICO Eastern Africa) facilitating a session at the innovation platform meeting (photo credit: Apollo Habtamu/ILRI). Identify emerging business opportunities and models. Develop a plan of action for the next 6-12 months. 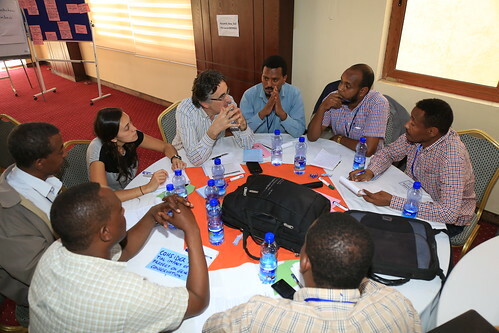 The ACGG Ethiopia team hosted the event, which was facilitated by the PICO Eastern Africa team. The IP members took it upon themselves to discuss a variety of issues but they eventually zeroed in on priorities for implementation in 2016. The selection of chicken strains that are locally appropriate following the principle of ‘do no harm’ on the genetic biodiversity of the countries where ACGG is active. Gender issues and what measures to take to make gender transformation happen in the project where women are so central. How to ensure that the innovation platform is not repeating and duplicating past work and conversations are contributing to innovations over time. Land availability for smallholder poultry farmers and related legislation. Availability of inputs – particularly feeds – that make up nearly 70% of the costs of poultry production in the country. Understanding and stimulating the demand and consumption of chicken and related products. Sub-national coordinators being interviewed about their experience (photo credit: Apollo Habtamu/ILRI). Undertaking an analysis of policy gaps in the poultry sector in Ethiopia (including issues of taxation, land use etc.). Production of small quantity packages of feeds to be made available to smallholder chicken producers. Analyzing how to make feed (technology) accessible, affordable and appropriate. Tailor-made training targeting value chain actors with specific references to smallholders. The seventh action area (financing) did not have any champion and was thus not addressed in this meeting. The value of innovation platforms in Ethiopia has been described in the past. The Ethiopia national platform is slowly showing more and more the value that it brings to the stakeholders. 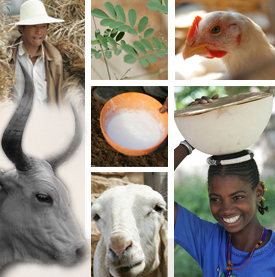 Since the first national platform meeting, a number of outputs have been developed and progress covered, such as the identification of feed sources in the four regions where ACGG is active, the development of manuals on how to deal with Marek’s disease, various awareness creation activities and characterization of local production systems in terms of chicken genotypes etc. 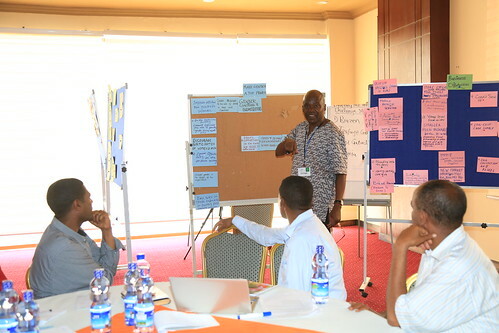 The next Ethiopia national innovation platform meeting is scheduled for October 2016, and a number of follow up points will be on the radar screen of IP members to verify and discuss then including: the participation of representative farmers and financiers (finance bureaus, micro finance institutions), demonstration of progress in each action area and linking up with community level innovation platform meetings etc. 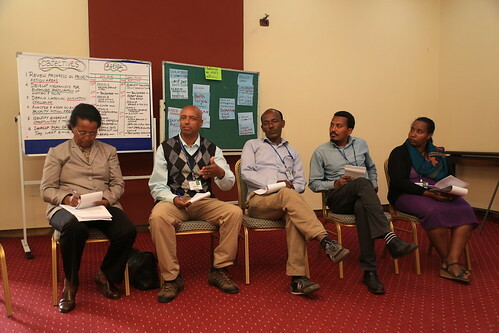 Transdisciplinary research is hard and innovation capacity does not grow overnight, but the Ethiopia national innovation platform members are showing a lot of dedication to develop innovations and every little step is helpful in that direction. Tags: innovation platform meeting, innovation platforms. Bookmark the permalink. Kudos to ACGG-ETHIOPIA. The tunes from the country IPs have started sounding similar.